The news about 11 Spring keeps rolling in! I was just in New York for a week, and happened to be staying within walking distance, so I was able to stop by a few times. Each trip was rewarded with something new, sometimes big (like Skewville’s amazing Grand Closing installation) and other times small (like Mark Jenkins’ almost invisible packing tape baby). Meanwhile, Michael Natale over at GammaBlog has put together a really nice video about the building, using Flash to combine his own photos with others’ (including one of mine) for a sort of audiovisual guided tour, complete with narration and mood music. I’ve always wanted to build some kind of tool for telling stories, building linear narratives that weave through time and space, within the grafarc interface. Mike’s video proves that a guided tour can be quite compelling when done well! It’s also a great example of Creative Commons licensing and remix culture at its best. Look for more updates and new walls in the coming months. Shown here: candle/south 11, November 6, 2006. Photos by Nicholas Noyes. At long last, Graffiti Archaeology hits New York! 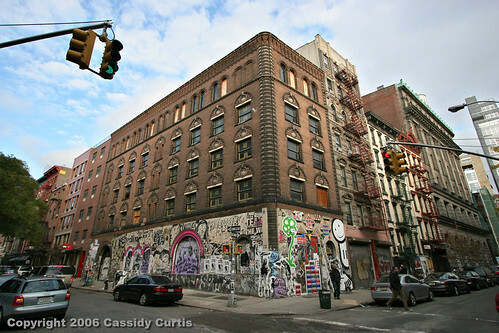 As I mentioned earlier, we’ve been covering the Candle Building (11 Spring Street) for a couple of years now. But the pace of change has picked up sharply in the past week thanks to our friends at Wooster Collective. The south wall now features fresh work by artists Michael De Feo, Above, Elbow-Toe, WK Interact, and The London Police. Earlier layers include the work of Judith Supine, Shepard Fairey, Empte Eyes, and more. I’m happy to be able to show some different styles of artwork on the site. 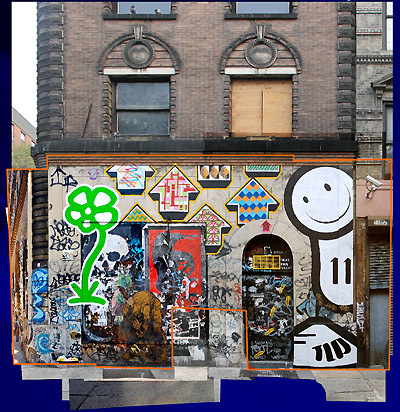 Graffiti Archaeology was originally inspired by the aerosol arts of San Francisco, but the idea is not bounded by style or location. Many thanks to the New York-based photographers who contributed to this montage: Nicholas Noyes, Sam Horine, Jake Dobkin, Luna Park, and guy_on_the_streets. I’ll be in New York next week to get one more layer of shots. I’m already working on a montage of the much larger western wall of this building, but it will have to wait ’til I get back. Stay tuned.